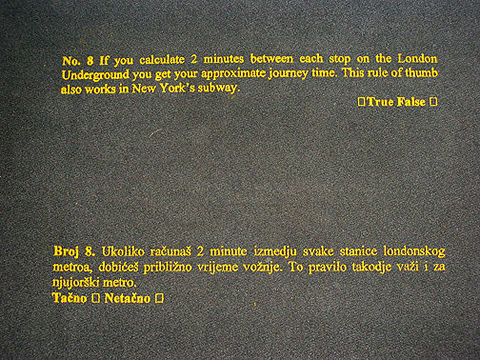 The project entitled 'URBAN MYTHS' consisted of these two elements. PART 1 LOCAL RADIO BROADCAST: URBAN MYTHS One element consisted of a CD ROM of 10 short urban myths made for broadcast on local radio. The recordings are of various people narrating the myths in different languages. 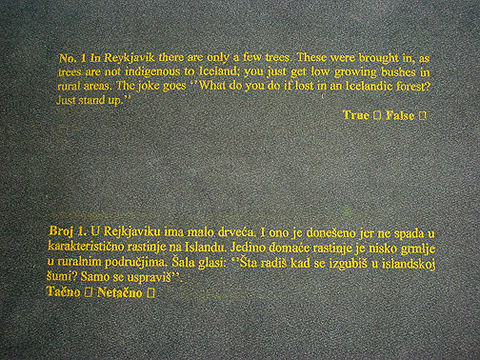 The languages are : English, Irish, French, Swiss German, Dutch, Mandarin Chinese, Polish, Czech, Slovak, Slovene Spanish and of course Serbo Croat. These stories were broadcast from the CD-ROM on a local radio station intermittently, between programs and during breaks. Tracks were played through out the weekend of the opening and will be played randomly during the duration of the exhibition. The choice is with the DJ which track to play, in which language and when. No track is longer than 30 sec. The idea is that these urban myths would act like punctuation to the day, they are like surprise short broadcasts in the middle of a normal day's broadcasting. 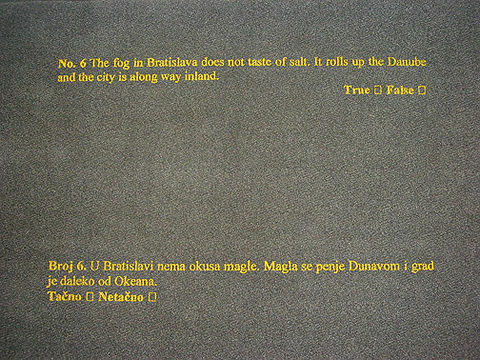 This was one strategy to disseminate urban myths about different cities in the urban context of Cetinje. 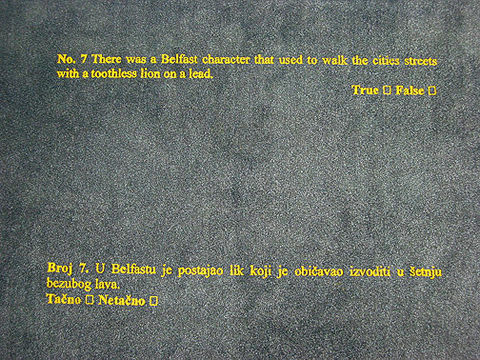 PART 2: MATS, URBAN MYTHS The 10 urban myths also manifested themselves as printed stories on mats. 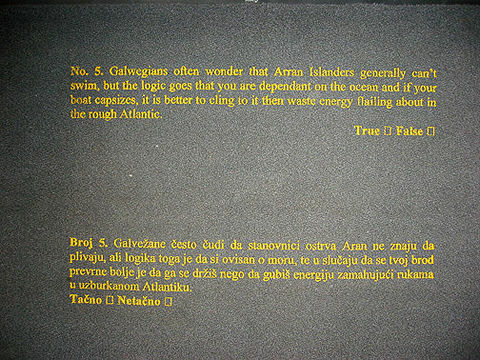 Each story was printed in yellow in English and Serbo Croat on a 6' by 4' grey, industrial mat of the sort normally found at the entrance to public and civic buildings. The yellow ink on the grey mat operated much like road markings on tarmac. The insinuation was that they adopt both a civic language and a street language. The mats were placed outside various civic and former ambassadorial buildings around the city. Some of the locations were as follows: The mats behaved like thresholds, marking your arrival or departure.